THREE TENORS BROOCH of Zygo Pink/Zygopetalum, Buttercup White/Trichoglottis briachiata hybrid and Epidendrum Pacific Sunsplash orchids; cold-joined and hollowcast, made 2008; enameled twenty karat gold, set with five diamonds, 8.9 centimeters (cm) long, weighing 91.1 grams. The intricate enameling and fabrication process is similar to that described for the butterfly brooch in this article, in contrast to erroneous accounts stating that the actual orchids were dipped into wax. Since 2002, Freda has made a series of about fifty orchid brooches for Tiffany & Company (Jazzar and Nelson 2015). In the 2008/2009 Tiffany catalog, this orchid brooch was priced at forty-five thousand dollars. Private Collection. Photograph by David Behl. How do you look at a piece of art, or for our readers, an artist-made piece of jewelry? Does your reaction differ if you base your opinion on merely what you see, or does knowing about the underlying materials and processes affect your reaction? Most of us decide quickly if we like or dislike something, even if we have the background knowledge to engage in more deliberate consideration. This may occur even during the judging of a competition or a show, although one would certainly then further appraise the design, crafting and other relevant factors before arriving at a final decision. After looking critically at jewelry of all types for over four decades, I am still shocked when what I thought I knew differs from reality, as with the case of Pat Tseng’s fiber and stone jewelry (Liu 2015). Similarly, even though I have known David Freda since at least 1981, (he won the 1984 Ornament competition Juror’s award by Lloyd Herman [a jewel box/neckpiece with black rat snake eggs and hatchlings, along with the mother snake]), had attended one of his moldmaking workshops, and photographed his earlier work, my recent studio visit with him revealed a complexity, intricacy and difficulty of execution in his work that was well beyond what I knew. DAVID FREDA AND TRISH MCALEER’S SECOND FLOOR STUDIO, wonderfully flooded by light, partially blocked by removable blue window panels. Visible are enamel powder vials on tabletop (each with fired samples on lids), kilns, vacuum caster, metal melter, wax injector and metalworking tools, as well as biological study specimens and live plants, mostly orchids. Cabinets hold projects in progress. Photographs by Robert K. Liu/Ornament Magazine, except where noted. With my background training and research as an ethologist who studied fish behavior, Freda and I share common interests. In 1986, I traded a long run of Copeia, the leading journal for ichthyologists and herpetologists, for an enameled pupfish, which is still in progress due to the challenge of this project (to get the correct color of a breeding male pupfish, Freda went to Salt Creek in Death Valley to photograph them). His grandfather was a jeweler and Freda still has his riveting hammer. His father was a skilled machinist, so he acquired much technical knowledge working summers with him. He is perhaps the metalsmith with the most knowledge of nature and easily qualifies as a true naturalist jeweler. Freda has extensive working experience as a wildlife illustrator, raptor bird bander, falconer, taxidermist, and past curator of a wildlife center, as well as certified scuba diver, technical rock climber and avid mountain biker. Any visitor to the home of Freda and his partner Trish McAleer, also a metalsmith, cannot help but be aware of his deep interests in nature, which she shares. A full scale and accurately detailed replica of a Latimeria coelacanth hangs on a wall, something rarely even seen in a museum. A cat, two Siberian huskies and some walking stick insects share their home, along with numerous plants (especially orchids) and outdoor beehives. Past and contemporary depictions of nature, whether botanical or zoological, were often caricatures of the actual plant or animal, frequently overly ornamented with jewels. G. Paulding Farnham’s orchid brooches made for Tiffany in the late 1800s-early 1900s were a mix of naturalistic blooms with excessive gemstone-set floral components and stems, although at least one example was devoid of gemstones. The Farnham orchid brooches may have been partly electroplated, which may be the basis for internetstatements about the orchid blooms being dipped in wax, as electroplating can involve wax. Lalique was the least susceptible to this tendency of overusing precious stones, and set only a few gems, although his enameled plants and animals were more impressionistic than realistic. STUDY OF NORTHERN BLACK RAT SNAKE NECKLACE, closeup showing eggs and hatchlings, of enamel over fine silver, with gold jumprings and Czech glass beads. Multiples of this necklace have been made from 1984 to 2000, his only limited production design; this necklace is 24.1 centimeters long, with eggs 2.7 cm each. The late Barbara Rockefeller owned the first snake egg and hatchling necklace made by Freda. Mobilia Gallery Collection. For someone like Freda, who both loves nature and intimately knows and appreciates the anatomy of plants and animals, it would be almost a sacrilege not to replicate them fully and accurately. When he talks about his jewelry depicting members of the natural world, he states it is “pretty sacred, making these things.” I think his pride would not permit him to make replicas of nature that did not satisfy his high standards. When you couple this commitment to his superb technical prowess, it is easy to understand his devotion to the process of making a piece, from which he certainly gets his high. If one understands the technical and engineering challenges involved in each step of his fabrication process, one can begin to also realize the satisfaction that must reward the maker when making progress with such difficult procedures. His jewelry usually takes months to complete, so daily positive feedback is vital. This passion no doubt holds for many craftspeople when producing art in their studios; many remark that time often appears suspended, like being in a zen state. him a year of experimenting before he was ready to start producing the gold orchids, as it is much harder to enamel gold than silver, in part due to the alloys in gold (Fabergé enameled on silver but Lalique used gold, although he did use aluminum for structural elements of his jewelry, Harrison et al. 2008). CABINET TOP WITH BUTTERFLY BROOCHES IN PROGRESS, along with color photocopies and photographs of the individual species. The photocopies of the actual wings are part of the documentation process that Freda follows to ensure accuracy of the intricate mosaic enameling on his butterfly brooches. The far left piece in progress is that of a moth. Photograph by David Freda. Freda took about a year to work out the molding of the orchids, their hollow core casting and enameling. The blooming orchids, or other specimens to be cast, are actually dissected into components, which then have silicon rubber compounds poured around them to make two part molds, from which the hollow waxes are made by injecting molten wax into the molds. He achieves hollow waxes by a clever process of blowing into the mold after the outer layer of the wax has set, with the force of the air from his mouth expelling the still molten portions of the wax from the mold. Such waxes are what enables him to do hollow casting. Because of the small spaces involved in his casts, he needs to use syringes to place the investment within the tiny apertures of the hollow waxes, as well as filling other spaces and gaps inside the investment flask used for lost-wax casting. If his casts were solid metal, the varying coefficient of expansion (COE) of the metal and the enamel could result in cracking or crazing of the enamel, similar to what happens when one attempts to work with glass of different COE. Since the butterfly wings of his brooches are solid but very thin, such problems do not occur when they are enameled. Additional factors in favor of hollow casting are the need for the jewelry to be as light as possible when worn, yet be strong enough to bear the stress of being worn, and that enamel looks better on hollow metal. WESTERN TIGER SWALLOWTAIL BROOCH IN PROGRESS, with lower wings enameled, upper still bare gold, all cold-joined, 9.3 cm wingspan; actual butterfly was collected in southern California. Compare this to experimental work on facing page, of another swallowtail butterfly. His enameled jewelry is twenty karat gold, but findings are eighteen karat. To be able to make good molds and the requisite air venting, waxes, their sprueing, investing, burnout, and casting all demand a high level of skill, luck and magic, although proper utilization of the vacuum in mold making, investment preparation and metal casting are all critical to success. Since Freda does all these steps himself, it is a given there are strict standards of control and quality in his artwork. While these fabrication procedures are difficult and time consuming, it is his enameling that is awe-inspiring. Since I have had a long interest in insect jewelry (Kuehn 2003; Liu 1998, 2003), I am aware that none of the historic or contemporary interpretations of insects begin to approach Freda’s representations in accuracy of anatomy or coloration, both vital in characterization of such animals. PROCESS FOR MAKING DANIS DANIS BUTTERFLY BROOCHES; the actual Danis butterflies are native to Australia and New Guinea. The finished brooch, of twenty, eighteen karat gold and platinum, has a wingspan of 5.7 cm, weighs about twenty-nine grams and has two marquise-set diamonds on the platinum antenna and thirty pavé-set diamonds in the abdomen. Due to the intricacy of the processes in the fabrication of these brooches, only some of the enameling and assembly steps are shown and described. 1 shows enlarged color photocopies of the wings, the lower wings partially enameled, and enameled gold cutouts with gold granules, and thin gold strips with white enamel, to be placed and fired onto wing. 2 shows the photocopies, lower wing with additional enameled elements, bare gold upper wings and actual butterfly wings on the plex block to the right. The wings and body have been scaled up from the real specimen. 3 Mirrored stencils for the turquoise decorations on the upper wing, placed onto the bare gold. 4 Upper wings now enameled in black/white, with wing areas ground to bare metal for placement of counter-enameled turquoise wing pattern pieces, shaped like the stencils. 5 Both wings cold-joined to temporary body, and a few of the turquoise decorations in place. 6 Wings completely enameled, with finished abdomen and wax components of the body in place. 7, 8 Obverse/reverse of finished Danis danis brooch, laser-welded and cold-joined, after three months work. All screws have tube-set diamonds on top. Process photographs by David Freda except 7, 8 by Robert K. Liu/Ornament. Just looking at part of the processes involved in his enameling of butterfly wings provides a good indication of the complexity of his techniques in this media, which Freda terms “mosaic enameling”. Besides the overall patterns of the upper and lower wings, which are based on color photocopies of the actual wings, smaller, contrasting spots of color are often separate cutouts of gold sheet, copied from precise stencils. These tiny pieces, some only millimeters long, are adhered onto wires protruding from a wire trivet, using his own adhesive mix of Klyr-Fyr, water lily root and saliva (the latter is also used by Mauritanian women bead artists when they wetpack glasspowder for Kiffa beads). Two hundred grit enamel, either Ninomiya or old Thompson leaded enamels are sifted onto these pieces of metal, then fired briefly at well-controlled temperatures for up to ten times, with the color checked against the actual specimen depicted (Gans 2003). These fired pieces are placed in precise patterns on the wings, often after the underlying enamel has been ground off to expose the gold. These steps are repeated until obverse and reverse sides of the wings are fully patterned accurately. Fabrication of a butterfly brooch takes three months of constant work. FREDA’S JEWELRY BENCH, with an orchid brooch project in progress. All the rotary tool bits are neatly laid out in rows on gray felt, as well as his hand tools. All parts are in small containers. Visible to left is casting and kiln equipment, plants and biological specimens. Freda sets gemstones, like diamonds, into the platinum body and antenna of his butterflies, as well as gold granules onto the wings. These embellishments add to the perceived and real value of a piece, possibly at the request of the firm or individual commissioning the piece. While his jewelry is not really priced according to the value of the precious metal and gemstone content, they are at the top end of contemporary artist-made ornaments. Nowadays, the clients are often from China, Japan or the Middle East. One of his older orchid brooches sold at auction for ninety-four thousand dollars, with a beginning bid of thirty-four thousand; this hammer price is rare for living jewelers. While Freda is still young and in the prime of health, he has already attained a level of achievement that future jewelry historians might regard as somewhat reminiscent of Lalique and Blaschka, the Bohemian father and son team of the nineteenth, early twentieth century who made astounding painted botanical and marine invertebrates in glass, including orchids. Freda’s vast practical knowledge of biology, derived often from living plants and animals, and his largely self-developed metalsmithing and enameling skills have undoubtedly been the foundations of his success, along with a dogged determination at solving problems. An admitted dyslectic, he appears to have compensated by arranging his studio environment so neatly and logically as to fit his particular way of working. BRAZILIAN RED LAND CRAB AND HEAD OF BLACK INDONESIAN RAT SNAKE, both hollowcast, respectively of gold and fine silver, crab 7.0 cm wide; entire snake was thirteen feet or over 396 cm long. The crab consists of carapace, legs and claws, all cast separately, then cold-joined. Eventually, both will be enameled. David Freda is very much a jeweler in transition, now that he will concentrate more on selling to private clients or collectors. Since his pieces are so time-consuming, he needs time to build up an inventory. With his inquisitive and inventive mind, it is hard to predict how his work might change, especially with his intense fascination of nature and willingness to challenge himself even more, especially if there were less restraint on his artistic license. Robert K. Liu is Coeditor of Ornament and for many years its in-house photographer. His recent book, The Photography of Personal Adornment, covers forty plus years of shooting jewelry, clothing and events related to wearable art, both in and out of the Ornament studio. Recently he has been teaching one-on-one photography lessons at our offices, as well as teaching workshops on bamboo jewelry. In this issue Liu writes about David Freda, who is as much a naturalist as he is a superb enamelist and jeweler. His techniques are among the most complex the author has seen in over four decades of writing about jewelry. PAVE CUFF of eighteen karat gold, oxidized silver, diamonds, 2014. DIAMOND SLICE NECKLACE of eighteen-karat gold, diamonds, oxidized silver, 2011. Photograph by Shannon Partrick. 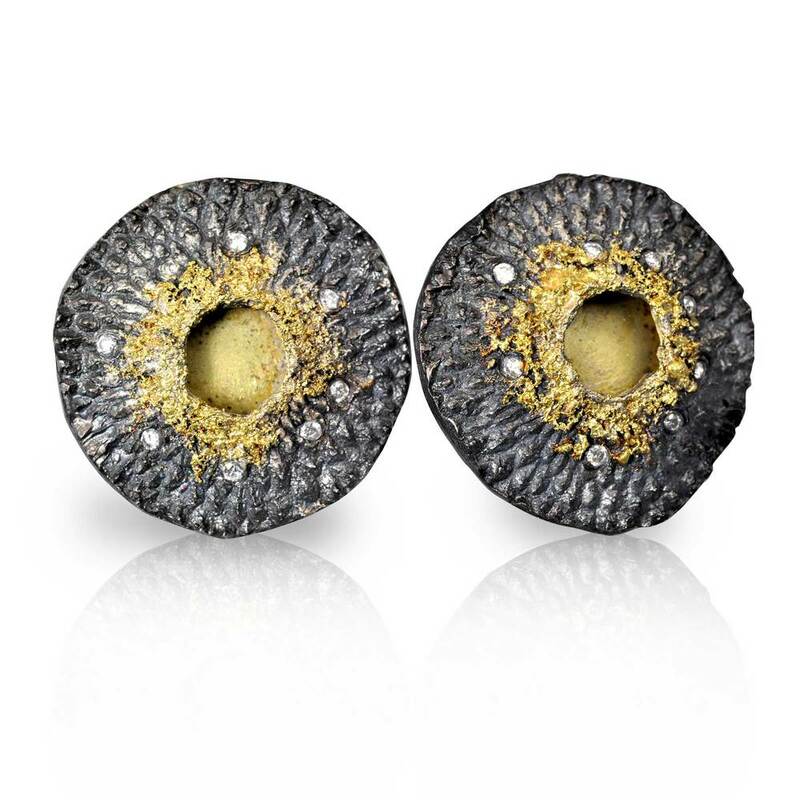 POD EARRINGS of oxidized silver, twenty-four karat gold, eighteen karat gold, diamonds, 2014. Photograph by Julieta Rivarola. For the past two decades, Rebecca Myers has been steadily producing an impressive line of jewelry that has evolved from the clean, minimalist lines of contemporary design toward more open, sinuous and organic forms, many of them derived from motifs in nature. Her path has been one of constant experimentation with materials and techniques, while always striving to keep the essential elements in balance: symmetry and asymmetry, light and dark, abstraction and representation. ASYMMETRICAL CACTUS LeAF EARRINGS of oxidized silver, eighteen karat gold, diamonds, carved, cast, 2014. Photograph by Shannon Partrick. The earrings, as well as a related seed pod necklace, can be traced directly to a transformative trip that Myers took with her then-fiancé to Costa Rica’s Corcovado National Park in 2003. “We hiked through the forest there, and I picked up seed pods and brought them back. Out of a whim, I put them in the kiln and burned them out and cast them. * And I just started experimenting with them.” The success of these early experiments led her to push further in this direction. In addition to the pods, you will also find butterfly wings, cactus leaves, magnolia buds, and star anise, among many other forms, cleverly integrated into her designs. Some of these elements remain very much what they are, like the tiny bees that appear on many pieces, looking like they have just landed to extract some nectar from the glistening stones and precious metals. Other forms are more abstracted, as in the Monarch Necklace, on which the elegant butterfly-wing patterns are inlaid in twenty-two karat gold into sections of smooth oxidized silver, the contours of their joining accentuated with constellations of small diamonds. Sometimes a stone takes center stage, as in the Ruby Cuff, which features a bold ruby in an oval frame of lustrous twenty-two karat gold studded with diamonds. This is set atop a cuff of oxidized silver with the abstracted monarch-wing pattern inlaid in eighteen karat gold. A moonstone ring, meanwhile, features a milky-white orb set in a thick, diamond-strewn eighteen karat gold overlay that seems to flow like lava over the grooved patterns in the oxidized silver below. MEXICAN FIRE OPAL NECKLACE of fire opal, diamonds, eighteen karat gold, oxidized silver, 2013. Photograph by Ralph Gabriner. Myers credits her deepening appreciation for the natural world with opening her work over the past decade. Before the Corcovado trip, she says, “the work was very tight—it was very geometric, because the inlay process really demanded that. It wouldn’t allow me to be organic in my approach.” These earlier designs often featured alternating bands of gold and silver or platinum, with one metal either overlaid on the other or inlaid into channels cut into the mold, a technique Myers developed on her own. She still deploys these skills to great advantage, but her work has literally branched out in recent years, as she continues to incorporate forms from the natural world into her repertoire. For Myers, the artistic journey began early and has proceeded without interruption. “I remember my parents and teachers asking me what I wanted to be, and I always said I wanted to be an artist,” she recalls. The family started out in Philadelphia, where her father was a journalist for the Jewelers’ Circular Keystone (a trade publication, and, it turns out, harbinger of her later career) and the Philadelphia Inquirer. Even after they relocated to the more rural Lehigh Valley, some sixty miles north of the city, Myers still felt connected to the larger world of art. It was the 1980s, and artists like Keith Haring and Jeff Koons, both of whom hailed from nearby towns, were making a big splash in New York. “There was a connection to people in Pennsylvania who had actually crossed the line into the big art world in New York, and that was a huge inspiration to me,” she says. NATURAL GRAY DIAMOND RING of platinum, eighteen karat gold, diamonds, rough diamond, 2014. Photograph by Shannon Partrick. While still in junior high school, Myers earned a scholarship to take classes at the Allentown Museum of Art’s Baum School. “I had some really cool teachers there,” she recalls. “They were working artists, and they were also people who let me know what was going on.” She credits them with instilling in her the idea that “just because you don’t live in New York or Philadelphia doesn’t mean that you can’t do this.” She also studied with a local artist named Myron Barnstone. “He has a really intense program for high schoolers and professionals on drafting and rendering. It’s all very classical—the Golden Section,” she says. By the time she graduated high school, Myers had an extensive portfolio of two-dimensional works, on the strength of which she was admitted to Temple University’s Tyler School of Art. BARBIE DREAM HOUSE RINGS of mandarin garnet, beryl, aquamarine, oxidized silver, eighteen karat gold, diamonds, carved, cast, 2011. Photograph by Julieta Rivarola. The award helped Myers turn the corner. “It seemed like the floodgates opened after that,” she says. “I got introduced to Cindy Edelstein, Alex Sepkus, and that whole world, which is very different from the commercial, boutique world. Everybody was very encouraging. It made me feel like I could take the leap.” Even so, she waited another six months, quitting her job only after a show in Baltimore later that year put her beyond her goal of three months’ worth of new orders. Myers remained in the Lehigh Valley until 2003. It was there that she met her future husband, Troy Juliar, who was then an editor at the health-and-wellness publisher Rodale Press. When he took a position with Recorded Books, Inc., in Maryland, they moved south and Myers opened a studio and gallery in the quaint village of West Annapolis. In 2005, the couple was married at the American Visionary Art Museum, Baltimore’s spectacular venue for “outsider” art situated just off the Inner Harbor. They now live in Roland Park, just north of the city, and have a son in kindergarten. Since 2009 Myers’s studio and gallery have been located at Clipper Mill in Baltimore’s Hampden section, nestled between the Johns Hopkins campus and Druid Hill Park. The former site of the Poole & Hunt Iron Works, where steam engines, railroad cars, water-wheels, and other large components of the industrial age were manufactured, Clipper Mill is now home to a dynamic community of artisans and entrepreneurs, including the Corradetti Glass Studio, Gutierrez Studios (custom furniture), Mandala Creations (hand-forged metalwork), and Woodberry Kitchen, rated one of the finest restaurants on the East Coast. RUBY CUFF of oxidized silver, eighteen karat gold, twenty-two karat gold, diamonds, ruby, 2014. Photograph by Ralph Gabriner. “There’s a lot of great energy here,” says Myers. She points to the “fire pit,” a community hangout just outside the restaurant, where a few glassblowers are taking a break around the funnel-shaped fireplace, some fifteen feet high, welded from large scraps of metal and anchored to a circular platform bolted into the ground. “This was built in honor of the former owner of Gutierrez, John Gutierrez, who died,” she says. “Everybody in the community pitched in.” Across the street, in a sunken area adjacent to the massive old foundry building that now serves as an indoor parking lot, white marble steps lead to a swimming pool surrounded by tall classical columns. “In the summertime, this looks like Vegas,” says Myers. “The lanterns at the top of the columns light up, so there’s fire coming out of them.” If there’s such thing as a post-industrial paradise, this comes pretty close to the mark. Her studio, a high-ceilinged space with exposed beams and ducts, is subdivided into three sections. In the front is a gallery with glass cases displaying perhaps a hundred examples of Myers’s works across a range of styles. Behind the gallery, separated by a six-foot-high divider wall, is a fabrication room with three benches at which Myers and her two assistants assemble pieces, as well as a computer station and a laser welder. The third compartment houses the raw materials for casting (seeds, rocks, shells, branches, a nest with a robin’s egg still in it) and equipment for wax-injection molding, sand-blasting, and electroplating. Each space has windows that look out over the narrow walkway to an embankment covered with dense foliage. San Francisco, and other cities, as well as numerous trunk shows and other smaller events. When asked about her influences, Myers cites a few familiar names in the jewelry world who have impacted her work at different times, including Michael Zobel and Steven Kretchmer, along with some lesser-known figures, such as metalsmith and fellow Tyler graduate Robert Farrell. But as her personal role model she cites Peggy Guggenheim, whose collection of modern art she first came across on a trip to Venice in 2000, and whose autobiography Out of This Century she rereads every few years. “I love her story,” says Myers. “She just was really self-possessed and did her own thing. She did not conform in the least.” Words to live by, as this artist clearly does. *Editorial comment: The seed pod is invested in plaster; when it is burned into ashes in the kiln, the resulting mold is filled with wax. These are used to cast metal replicas of the pod.